Posted on 22nd April 2016 at 7:36 pm. So the scene is set, you’ve decorated the room for a troupe of mini pirates, what’s next? here is a rundown of the food we laid out for little Roos third birthday. 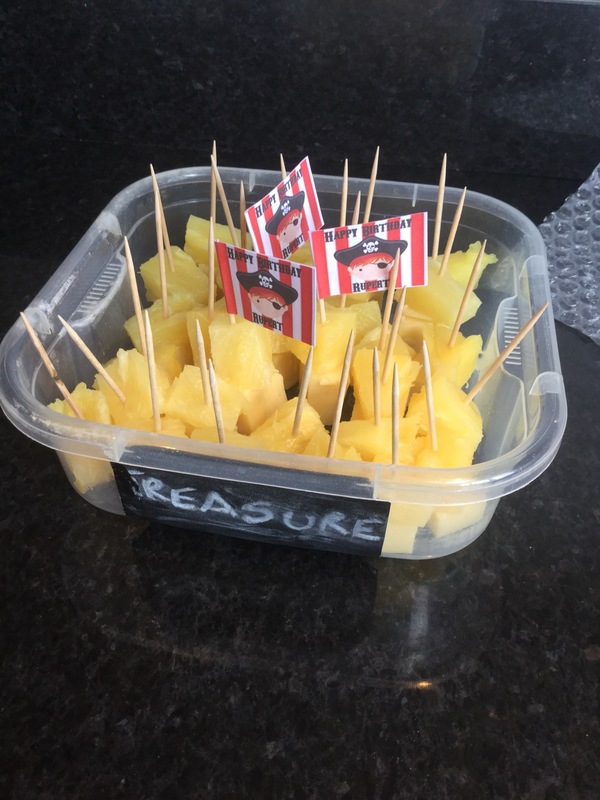 amazingly it was fairly simple, a few mini chalk boards from The Range and even the obligatory cheese and pineapple sticks were given a ‘jolly’; twist. The menu looks great what a grwaf theme to go with. I love the names use given the food. This is absolutely delightful! I love that pepper crab…. I want to be a guest at this party, it looks amazing! Brilliant ideas, lovely! We had a couple of pirate parties in our time, and I created a pirate party board on Pinterest. Just pinned one of your photos as a reminder if another one of my littles wants a pirate partay! Wow this is a terrific menu for a pirate party. Love the peglegs and palm tree. Bet this went down really well little pirates.